You had no problem picking out the curtains. You ordered the perfect track, coordinating drapery hardware, and all the right accessories. You have measured twice and cut once, gathered all the appropriate tools, and you’ve got it all laid out on the floor in front of you. It’s time. Installation time. As nervous sweat collects on your brow, remember, you are not alone. We are on your side. 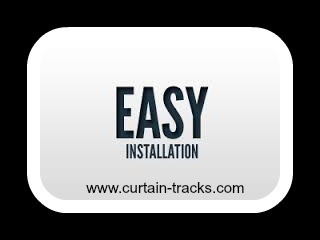 We want you to be able to easily install your new curtain track and we will give you all the help we can. Curtain track installation may be very new to many of you, especially if you’re used to using rods, but most of our tracks and accessories are easily managed by do-it-yourselfers. With a little guidance you should be able to leave it all up to the non-professionals. We offer a detailed online installation guide, and our customer service reps (available by telephone) know what they are doing. We have walked countless customers through this process, and we will get you through it as well! We have tried to keep it simple right from the beginning. The tools you will need are straightforward: drill, screw driver, laser level, and miter saw. The only other pieces you will have to pick up at the hardware store are the mounting fasteners (screws, toggle bolts, anchors, etc.). This is largely because the type of fastener you need is determined by materials used to make the wall or ceiling, which vary from customer to customer. Some of our tracks are drilled directly into the ceiling or wall, and some are fastened on by clips or clamps, so there is no one-size-fits-all instructions for curtain track installation. However, there are some universal truths: Screws or bolts that are inserted through the track slot must fit clearly through the slot without marring the track; brackets should be attached to ceiling joists and wall studs (or other supports) whenever possible; and great care must be taken not to bend the track while drilling holes (even a small bend can interfere with the glide of the carriers). You’ve got this! For detailed instructions specific to your track and drapery hardware, contact us at 888-434-7444. We will make sure your curtain track installation goes smoothly as planned.